Have a heart for the environment and want to go green with your gadget purchases? Then you might want to seriously consider the Renewable Energy Racers Set the next time you want to give a gift to your kids or grandchildren. These remote controlled racecars will be powered by three different renewable energy sources, where you can choose from a miniature windmill, a solar panel, and a hydrogen fuel cell. 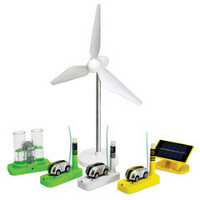 Basically, the whole idea behind this set is to demonstrate the possibilities of harnessing the power of the wind, sun and water around us for sustainable energy. Both wind and solar stations are capable of delivering up to 20 minutes of racing time from a 10to 30 minute charge, depending on wind speed and brightness of the sun. As for the hydrogen fuel cell, you get five minutes of run time from a three-minute charge. Each $89.95 purchase comes with a simple remote which has left/right and forward/reverse controls that work within a 10-foot radius. Neat!